I wanted to post a couple of cards I made last week. They have a combination of techniques and were just fun to make. Hope you enjoy. 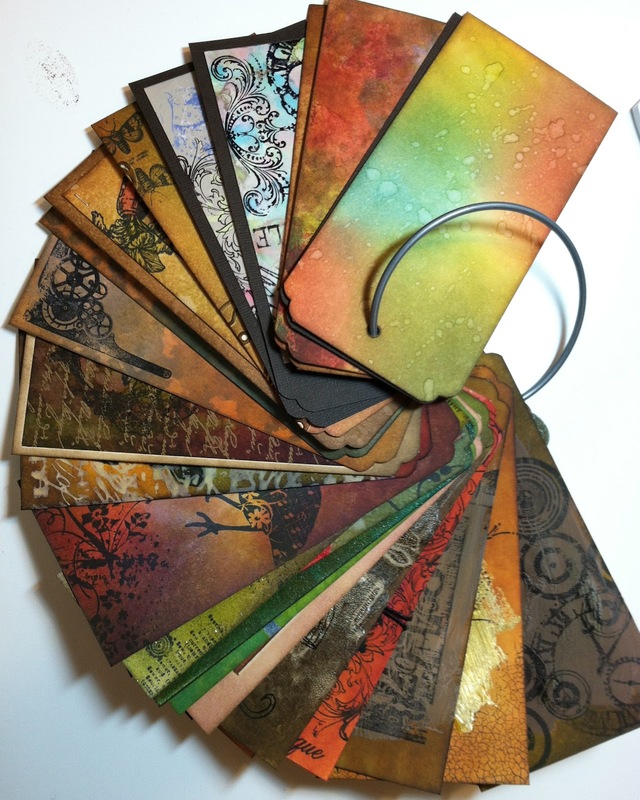 I have a couple of more cards that have been inspired by Tim Holtz techniques. These 2 cards are totally different as I have tried to add some femininity along with using these techniques with one of the cards. My first is a very familiar image that you should recognize. 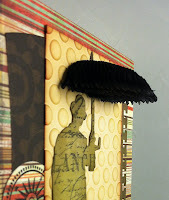 I used the Honeycomb from Inky Antics for the umbrella. This next card features Ranger Kraft Glassine Paper for the flower. 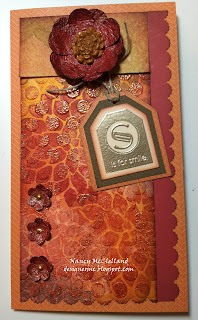 I used the Tattered Florals Sizzix Die and some Distress Ink. 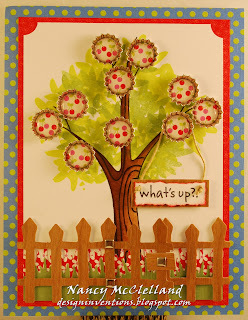 Fun card with a total different feel. Hope you enjoy and have a good week. I have also made a couple of cards using the tags. The first one has a tag using some Distress Stains for the base colors. 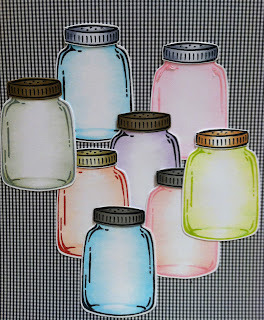 Then I stamped a few images on the tag and used Distress Inks rubbed on the tag to add depth and more color. 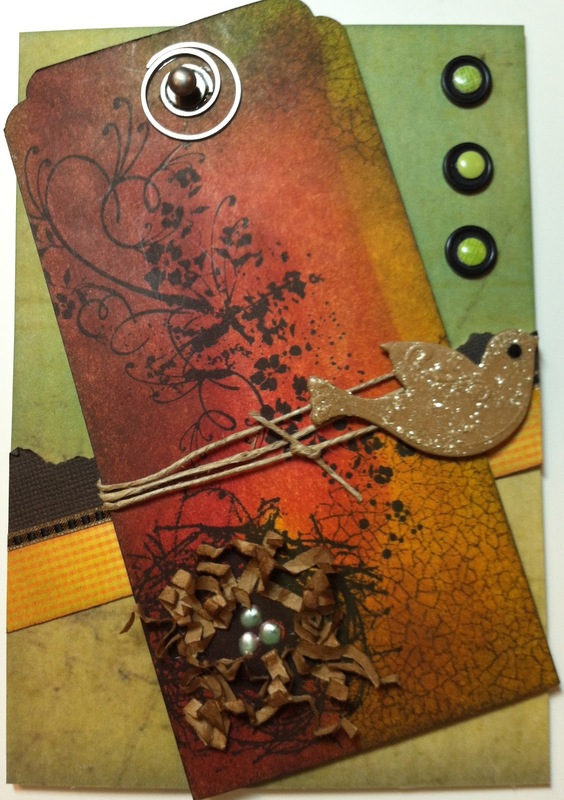 I added a little dimension for the birds nest, some twine and then the chipboard bird with some Distress Stickles. This last card I want to share has Distress Stain on the tag, then I stamped a few small images in black on the tag. 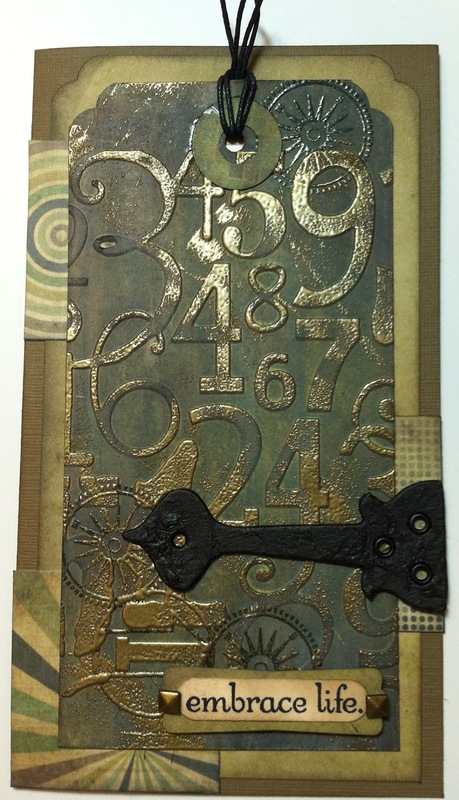 Then I selected an embossing fold with numbers to add the dimension. Using a clear embossing ink I randomly rubbed it over the face of tag and sprinkles some gold embossing powder over the embossing ink. I was careful to make sure I didn't have too much powder on the tag, so I used a small brush to remove some areas before heating. After the tag cooled I rubbed a few Distress inks over the card for more depth. The hinge is a pre-cut Grunge board shape and then covered it with Black Soot Crackle. 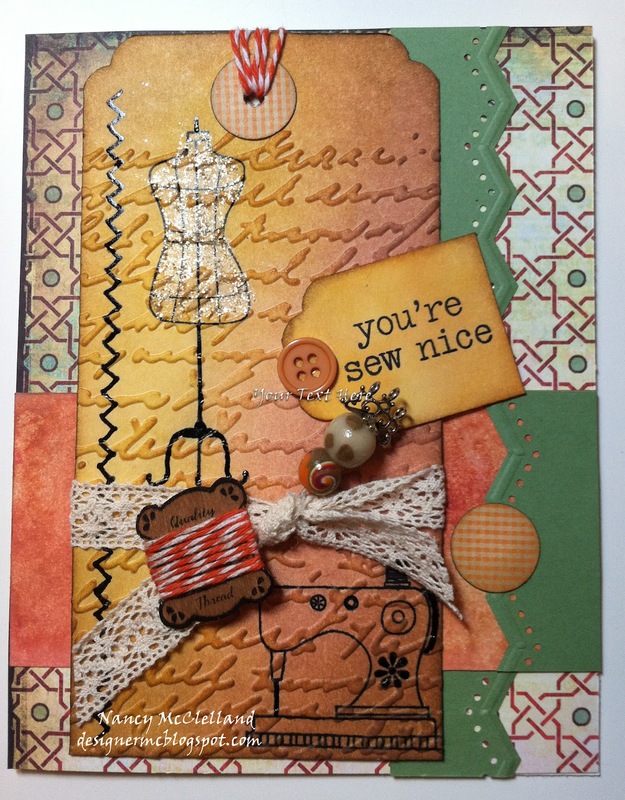 Adding a few more embellishments and sentiment and I have a fun masculine card. 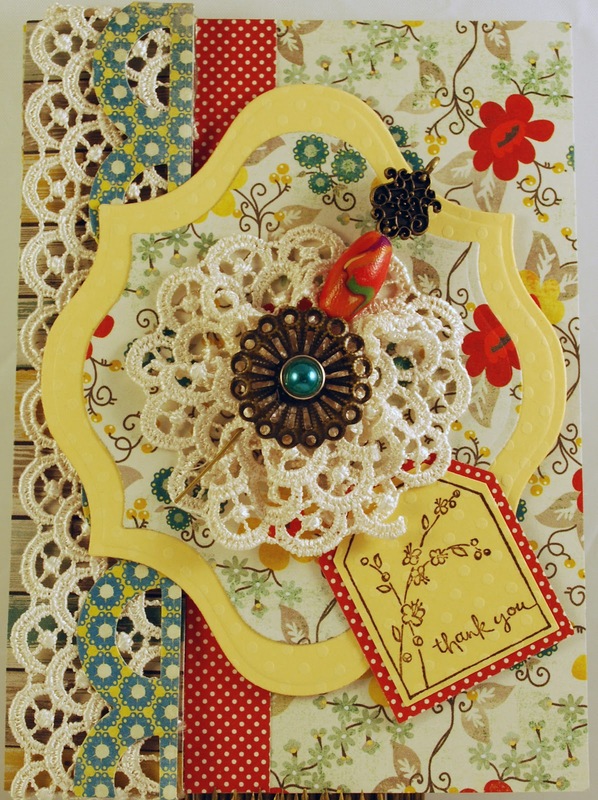 Thanks for stopping by, and have a Creative Day! 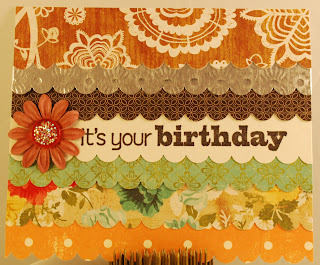 I wanted to share a Birthday card that I made for a special friend. I recently took the Creative Chemistry Online class and I decided to use some of the techniques from the class. I have used several of these techniques previously and it was fun to pull them out of the drawer and play. I made the center paper using alcohol inks and then stamped the butterfly. Finishing the decorative elements with a couple of Spellbinder dies and some ribbon. It was fun to go back and use things from the past and make a great card. 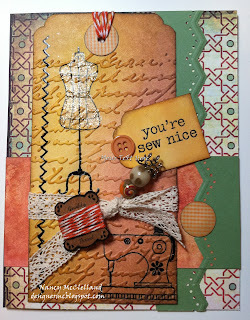 I wanted to share this card tonight that I finished about a month ago. I entered it in a PaperCrafts Magazine contest, but unfortunately was not selected, not that I thought I had a chance but I still sent it in. Sometimes I wonder if I try too hard and my cards are to complicated. Never know, but I'll keep trying. 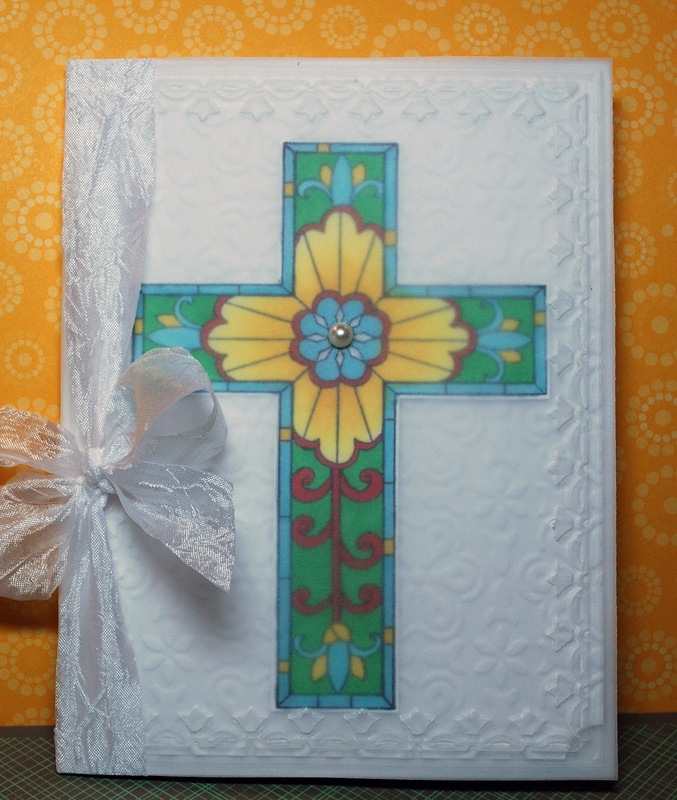 I plan to re-make the card since I will not get it back. It was fun to use the mini bottle caps on the tree. My fence was wood paper and it even opened with a gate. Hope you enjoy. 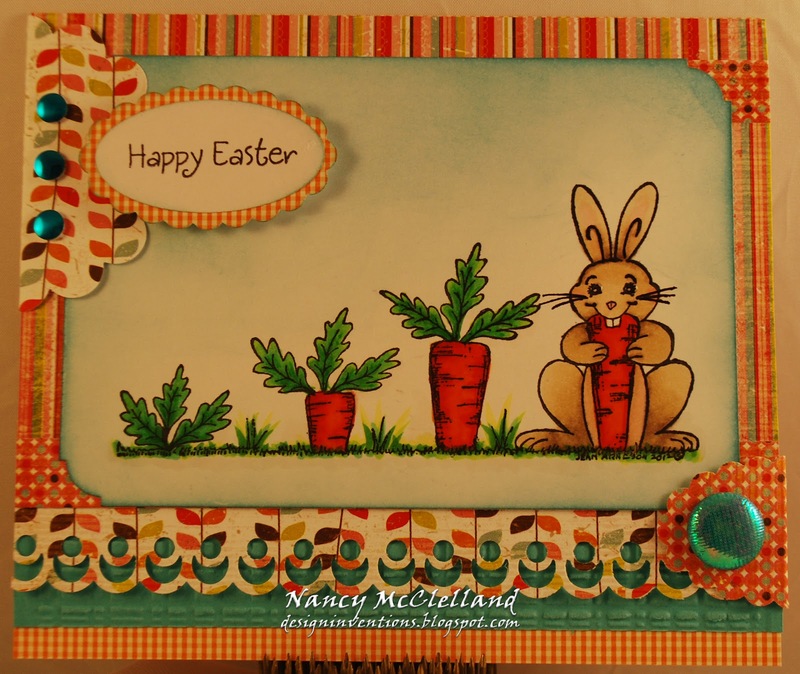 I wanted to wish everyone a Happy Easter, and what better way than with this cute bunny and his carrots! 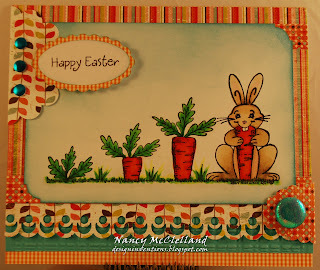 When I first saw this rubber stamp from Northwoods, I just laughed and knew I would use it for Easter. Copic Markers were used to color the image, a little Distress Ink for the sky and the paper is from Basicgrey. 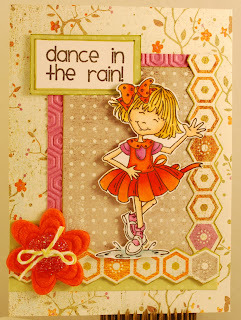 Well, it's actually very sunny outside today, but this is a fun girl that is splashing in puddles. I will be using this image in one of my classes next week at All About Pictures. 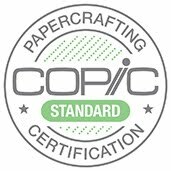 If you are interested in learning more, hop on over to the AAP blog ( here) and check things out. I'm off to church for the last 2 performances. 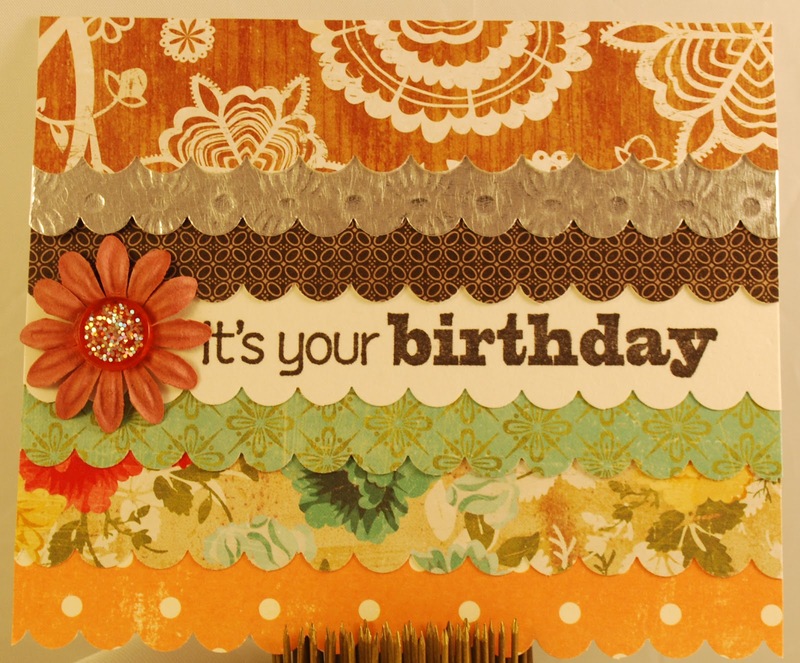 I hope you never get bored with just basic birthday cards. 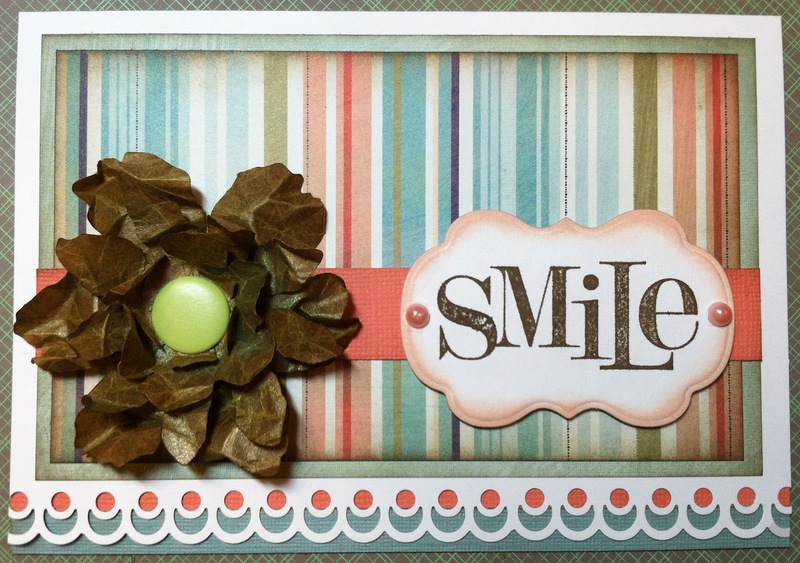 Today's post is so simple and shows how to use those small strips of paper you have left laying around. What's interesting is that none of the pieces really are from a collection, but they all still go together. 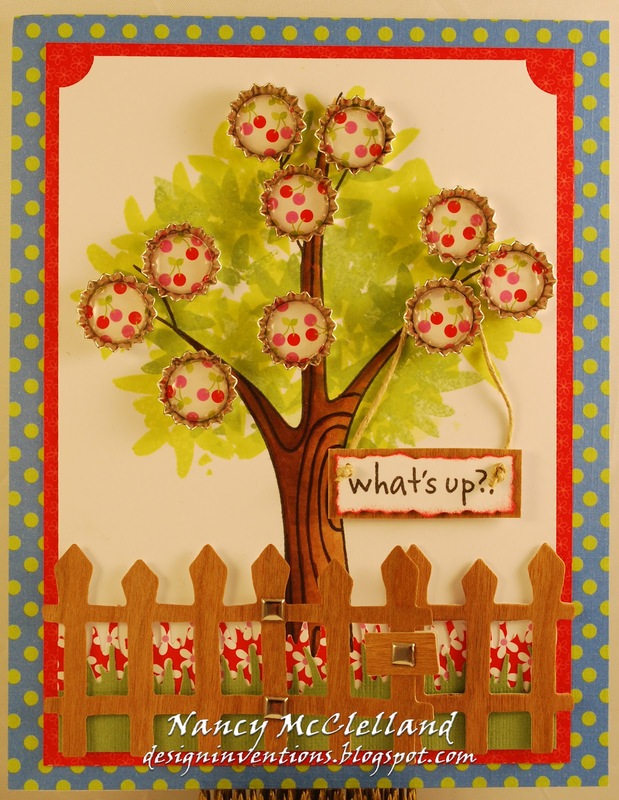 This just goes to show that you can gather up those scraps and make a cool card. 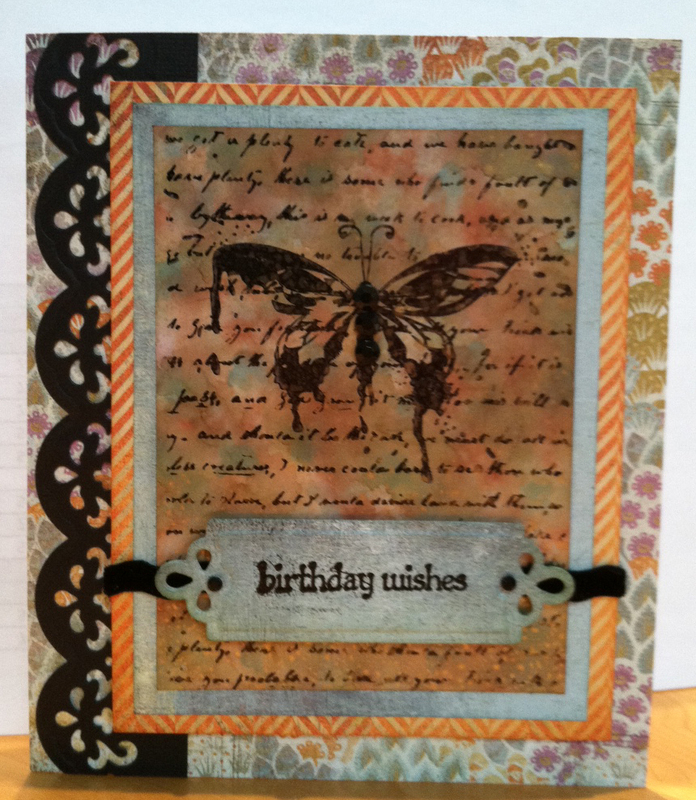 I used my scalloped border punch and applied multiple strips to the face of a card. Choose a sentiment and there you go. Hope you enjoy! Its been a busy week and I'm gearing up for another. I have been blessed and called once again this year to serve at my church in preparation for our Easter Pageant production. The past couple of years I've been in charge of the costumes, so I have been in the middle of fittings and dress rehearsals. The count down is on for this week with four presentations by the end of the week. 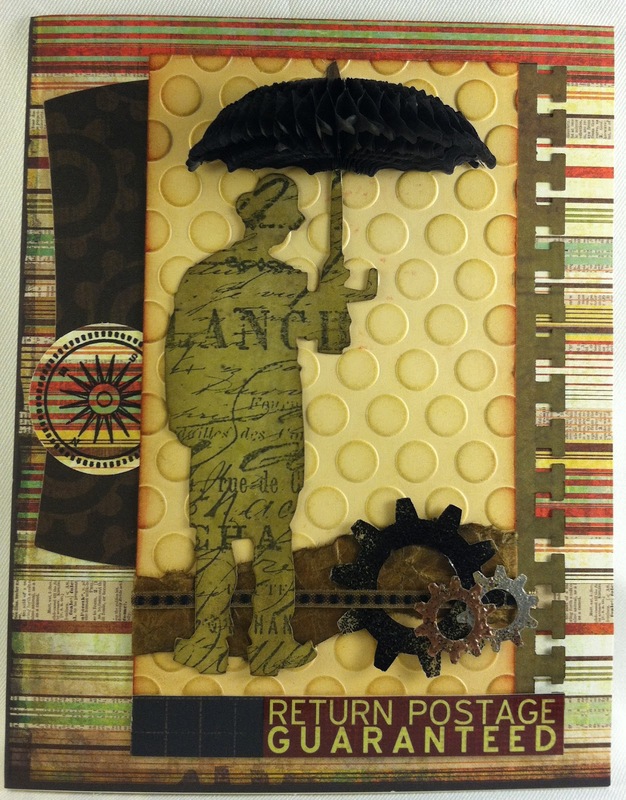 I wanted to share this special card that I made from a Northwoods Stamp. I thought it would make a beautiful simple card..
Hope to visit with another card this week.